With its acquisition of LinkedIn, Microsoft (MSFT) has entered the sweepstakes to become the first digital company to get to a trillion-dollar market cap. Microsoft is the fourth contestant to enter the race and joins Alphabet (GOOG) (GOOGL), Amazon (AMZN) and Facebook (FB). Even though Apple (AAPL) has the highest market cap at $618.3 billion, my prediction is that it will not be the first to a trillion-dollar market cap. The first to a trillion will be an online or digital company. Digital companies have highly scalable models that address more than a billion individuals. More importantly, digital companies have the highest profit margins and have superb cash flow when compared to non-digital companies. Microsoft’s shares are a key core long-term hold for every portfolio. The LinkedIn acquisition will result in an increase in its PE multiple. Since Microsoft has the highest free cash flow yield of the 10 companies in my digital universe, it's the most undervalued. Microsoft clearly has the potential to outperform the market. Most importantly, the downside for its share price is limited since the current dividend yield is 2.5%. With its LinkedIn acquisition, Microsoft has become a social media play. The $26.2 billion paid averaged out to $60 for each of LinkedIn's users. That compares to the average Facebook user being valued for $218 based on its market cap. There is also a logical argument as to why a LinkedIn user will ultimately be more valuable than a Facebook user. See "The untold secret of why Microsoft happily paid 26 billon USD for LinkedIn", June 2016. The evolution of the first two major digital innovations enabled the shareholders of Amazon, Google and Facebook to build dynasty wealth from what would be become the world's most valuable public companies. The third digital innovation, the smartphone app enabled Airbnb, Uber and Snapchat to become the world's most valuable private companies. The fourth, online equity crowdfunding provides Microsoft with a significant advantage to become the first company to get to a trillion-dollar market cap. The public has an insatiable appetite for making small bets and purchasing lottery tickets, etc., that provide the chance to make a big profit. The millennials will be a good example. Many will want to routinely invest $100 or even less into high-risk ventures that could produce returns of 10X to 100X. My argument is that the demand by the public to participate in online equity crowdfunding has been pent up since 1996 when the web started on its path to ubiquity. That demand was stunted by the SEC having had crowdfunding bans in place from its formation in 1933 to this year when the final ban was lifted in May. The online equity crowdfunding is in its infancy. However, it will evolve similarly to the web and will eventually become ubiquitous. From 1980 to 1995, online connectivity and its early players, CompuServe and AOL grew steadily. It was only after Netscape launched its free Navigator browser in late 1995 and Yahoo its free information portal in 1996 that the web took off and left the two early pioneers in the dust. The same thing will happen with online equity crowdfunding. My October 2014 equities.com article titled "Crowdfunding Must Get Back to Its Roots" was about the birth of the Social Investing Community industry. The SIC industry, which I am projecting will be as big as the social media industry by 2025, will drive online equity crowdfunding to ubiquity. Microsoft, with its ownership of LinkedIn, is extremely well positioned to be a major player. It has a monopoly on the business social media niche or community. By the way, equities.com is also well positioned for this new industry. To better understand why both equities.com and LinkedIn are uniquely positioned and to comprehend the significance of the emergence of the SIC industry, I recommend the six-minute video below entitled "The Social Investing Revolution; the Sequel to the Social Media Revolution has begun". With the onset of or advent of online equity crowdfunding, the percentage of the world population that has an interest in business and entrepreneurship will increase exponentially. I am projecting that LinkedIn's member base will grow to 700 million by 2020 as compared to its most recent 433 million. As online equity and debt crowdfunding become ubiquitous, LinkedIn will be able to add more products and services that will enable it to significantly increase its revenue and profits per member. It's for this reason that LinkedIn is ideally positioned. Many of its members or users will come up with a majority of the new business ideas that will be funded by Facebook's, Amazon's and Google's crowds. The SEC's lifting of its final ban will result in a majority of all developed and emerging-market countries allowing crowdfunding. Most will want to follow the lead of the U.S. by adopting the SEC's crowdfunding rules and regulations. Majority of the world's countries following the lead of the U.S. and its Securities & Exchange Commission to allow crowdfunding. Ericsson's estimates for the global smartphone user base and percentage that will be above the age of 18 by 2018. With the JOBS Act being enacted, the two bans that had been in place since the SEC was formed in 1933 were lifted. One prohibited companies from advertising to raise capital. The second ban, which was lifted in May 2016, prohibited individuals having a net worth below $1 million from investing into private companies. The ability to invest small amounts into the next UBER, which netted a return of $1 million in 2015 per $100 invested in 2010, will result in hundreds of millions participating in crowdfunding. My projection is that by 2021, $3.3 trillion per year representing 1 percent of all of the world's household wealth will flow from the crowd into the world's businesses. The fees and advertising revenue generated by businesses facilitating the raising of capital for companies via crowdfunding could be equivalent to 6% and could potentially grow to $198 billion per annum. The amount is eight times greater than the $23 billion of revenue that was generated by Visa (V) and MasterCard (MA) combined in 2015. The cumulative total of the fees that will be generated, and inasmuch as there is little required to close and/or service a crowdfunding transaction, will be staggering. Therefore, I predict that all of the world's largest digital companies including Amazon, Alibaba (BABA), Facebook, Google, Twitter (TWTR), LinkedIn, etc., will eventually participate in crowdfunding. For example, the facilitation of a $100 crowdfunding transaction will be much easier and less costly for Amazon than having to deliver its books, etc. Based on its market cap and share price, Microsoft has the highest free cash yield of all of the 10 companies in my digital economy universe. It also produces more trailing twelve-month (TTM) free cash flow than any of the other nine companies. The only other, "First to a Trillion" contestant that is in the same league as Microsoft is Alphabet. Both Microsoft and Google have more than double the annual cash flow of Amazon and Facebook. Should Microsoft's free cash yield decrease to become equivalent to Facebook's, it would win the trillion-dollar sweepstakes. My thesis is that history will repeat itself and that the markets for the first two years of the Trump presidency will behave similarly to Reagan's. Therefore, my prediction is that the S&P 500's close for the last day of 2017 will be lower than the close for the last day of 2016. Its because the probability is high that the U.S. will enter into a recession during 2017. See my December 2, 2016, article " Hangover from Trump Market Party to Cause Recession; History Repeats Itself". For the reasons that I surfaced in the article, my recommendation is that the shares of all large-cap companies be sold in the New Year with the exception being the four digital companies in the table above which most recently had free cash flow yields in excess of 4%. The four digital companies, Microsoft, Disney (DIS), Priceline (PCLN) and Alphabet for which I am positive will continue to outperform the brick-and-mortar large caps over the long term for one reason. The digital economy thrives on economic disruption. Therefore, the digital economy will continue to grow regardless of the industrial economy weakening or entering into a recession. I am also recommending that portfolio weightings for micro-cap shares be significantly increased. It's entirely possible that the share prices of micro-cap companies could go up significantly simultaneous with the highly valued shares of large companies trending down during 2017. 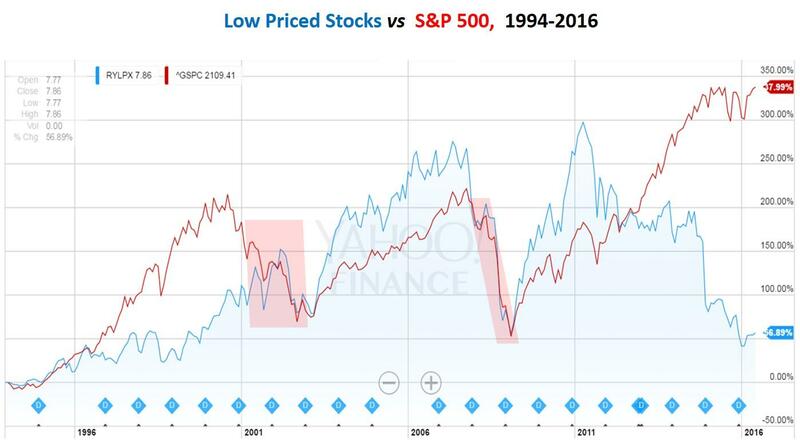 The chart below depicts the extreme divergence that is now in place between the share prices of large and small companies. I have not witnessed such a divergence ever before during my 40 years in the markets. See also my article "Trump Brings Small Company Tailwinds, Big Company Headwinds", November 21, 2016. The steady decline of the micro-cap market, culminating with it’s crashing to its lowest lows in 2016, is attributable to the passage of the Dodd-Frank Act, which made brokers, for the first time ever, criminally liable for recommending low-priced shares. To benefit from my sifting through the aftermath of the crash to find and recommend the best 100 micro-caps as soon as possible, I recommend a subscription to the Trophy Investing 100™ which includes a free two-week trial. The share price of a company recently named to the Trophy Investing 100™, which was one of my five micro-cap recommendations in the November 21st Headwinds and Tailwinds article cited above has already increased by more than 30%. I am projecting that the share price for the company will increase by an additional 100% or more by the end of 2017. The table below depicts the performance of the six companies versus the S&P 500 (NYSEARCA:SPY) that were recommended in my May 2016 equities.com article. The companies were recommended because they are best positioned to benefit from the ongoing transformation to the digital from the industrial economy. See equities.com "Digital Transformation Creates Industrial Graveyard". For an overview about me and access to links to the subjects that I cover, including the digital economy, negative rates, perfect shorts, and micro-cap stocks please go to www.michaelmarkowski.net. The signals for the NIRP Crash Indicator which has been monitoring the markets for crashes since March 2016 are freely available at www.DynastyWealth.com and are updated after the close of the markets each day.